What do homeschoolers do all day? 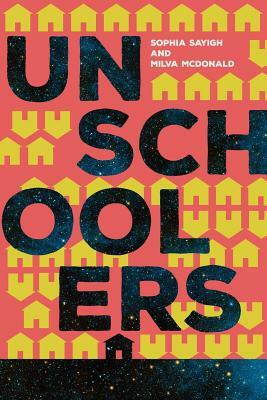 Unschoolers, a fictionalized portrayal of the lives of families educating their kids outside of school, answers that question with the power of story. Through day-in-the-life vignettes featuring mothers, fathers, children, and teens, readers are introduced to members of Home Learning Together, the support group that serves as the glue for a motley crew boldly opting out of the education system. Solid as a rock Teresa, outspoken Pina, and busybody Carmen grease the wheels and put out fires, all the while welcoming newbies into the fold. Jewel practices yoga but can't get herself to unwind, Priscilla yearns for a solution to her son's struggles in school, Alice gives her dog and her kids free rein. Meanwhile, children play, teens percolate, and the group gears up for the biggest potluck of the year. The connected stories reveal scenes from a typical homeschooling day for a variety of families, offering illuminating examples of self-directed and child-led learning, and bringing to life the human dynamics that arise when a diverse bunch of people come together on an unconventional path. Readers will encounter social standoffs, the vagaries of email, the headiness of adolescence, and the ups and downs of life with kids. While the book depicts children learning to read and digging into math and other subjects, and addresses the age-old question of socialization, it transcends the practical aspects covered by most books about homeschooling. Unschoolers delivers a charming volume unique in the canon of pages about homeschooling, unschooling, self-directed learning, and alternative education.